Admission Price: Free event; please register online in advance. A film about the life of Dr. George Daniels and his apprentice Roger W Smith. 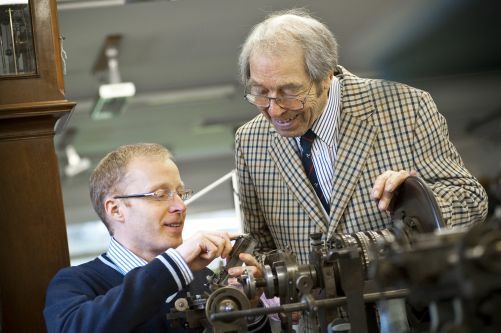 For Roger W Smith, Dr George Daniels CBE, DSc, FBHI, FSA (19 August 1926 – 21 October 2011) was both inspiration and mentor and, latterly, they created a unique collaboration to further develop the art of British mechanical watch making. Dr Daniels was single-handedly responsible for reviving the relevance and excellence of mechanical watchmaking in the modern world. Roger learnt from the master clockmaker all of the thirty-two skills required to design and make a watch in its entirety by hand. He has continued to honour his mentor by incorporating the Daniels Workshop into the Roger W Smith Studio; a unique labour of love in itself. “George’s whole workshop was geared towards the singular goal of one man being able to design and make a watch from start to finish” explains Roger. He now lives in the Isle of Man, which is fast developing its own reputation as a horological centre of excellence, and is a liveryman of the Worshipful Company of Clockmakers. More information about Roger W Smith. David Newman is a Freeman of the City of London, a Liveryman of the Worshipful Company of Clockmakers and Chairman of the George Daniels Educational Trust. Under Mr Newman's leadership, the Educational Trust encourages excellence in clock and watchmaking through education and apprenticeships, providing grants and bursaries to those wishing to make a career from horology in the UK. The Trust also provides grants and bursaries for postgraduate students in the School of Mathematics, Computer Science and Engineering at City. The film will be followed by a Q&A with Roger W Smith and David Newman.